When the Tuition Billing Method of a class is set to By Total Hours tuition is calculated using the amount defined in the Tuition Fee field on the Class record > Summary tab, and duration of the class, in conjunction with a Fee Schedule you define. If all of your classes are billed based on total hours you will select only the By Total Hours method in your Tuition Settings (Tools > Edit Settings > Tuition Settings). 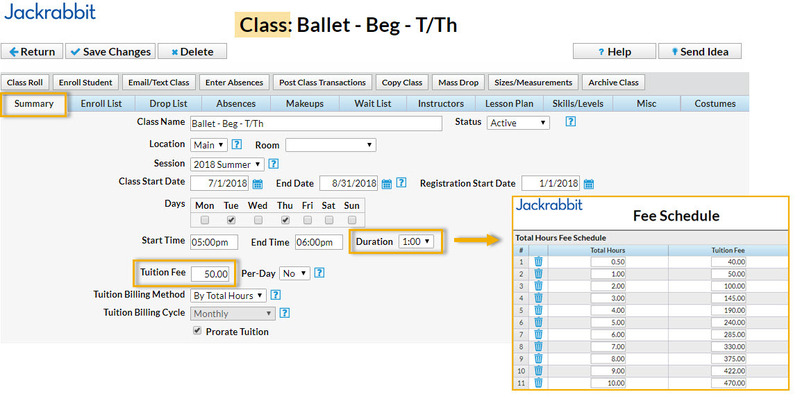 Jackrabbit will set all existing and future classes to have a Tuition Billing Method of By Total Hours and will hide the Tuition Billing Method field on the Class record > Summary tab. If you have some classes that are billed based on the tuition fee for a class, and you have also selected the By Class Fee Billing Method in your settings, you will need to make sure that each class is assigned a Billing Method. Classes that do not have a Tuition Billing Method assigned are NOT pulled into tuition posting; they will not be included in the total hours calculation. Tip: Use Edit All Classes from the Classes menu, and the search criteria Class Tuition Billing Method = No Value, to locate classes that do not have a Tuition Billing Method assigned. Total Hours Discount: Calculated using the class tuition fee along with amount outlined for that class duration in the fee schedule. Multi-Student Discount: Calculated based on the number of students in the family taking classes and the discounts defined in your Total Hours Discount Settings.